Cannot figure out where in my post I asked the community to plow the sand. Also I haven't asked for bright shining clever thoughts on software quality state. I have never thought that simple question (more focused on topic starter attantion) might cause such strong verbal diarrhea. 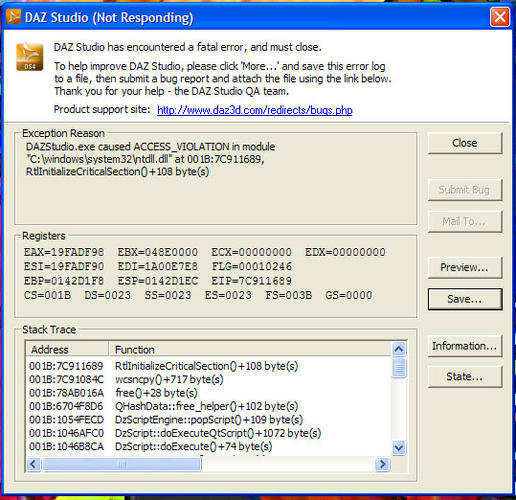 DAZ just crashes - works for a few second, but on the first click of any button and it crashes - when you go to save the error log it freezes - attached is all the details I can get off the screen. Which version of Windows and what bit count? Also, which video card and driver version?